The upcoming release of Liam Neeson’s new film “The Grey” has many wolf conservationists, animal rights groups and thousands of concerned citizens like myself quite concerned about this movie and what it might do to wolf recovery efforts and the fate of wolves like OR-7 – the first wild wolf to re-enter California in over 90 years. The movie grossly mischaracterizes wolves as blood thirsty, territorial hunters of humans and the plot makes it look as if the humans are being hunted and pursued by killer wolves as they desperately fight for their survival. Nothing could be further from the truth. Millions of wolves have been murdered by humans in the past while it is questionable if even a single human has been killed by a healthy wild wolf in North America in the time that records of such events have been kept. Nevertheless, people, particularly those in many western states have an irrational fear of wolves and this paranoia is likely to be exacerbated by the release of The Grey. In fact it isn’t hard to imagine that an anti-wolf zealot, incited by the film will take it upon himself to hunt and perhaps kill OR-7 or other wolves that are only just beginning to reestablish themselves in their former range. Further, the federal delisting process — which most wolf experts believe is taking place prematurely — is likely to be accelerated by the kind of propaganda created by this movie. It is also possible that this film will increase anti-wolf sentiment across the country and this may result in an increased demand for permits to hunt the few wolves that have begun to re-colonize the lower 48 as well as those that thrive in Alaska. Beyond this, it has come to the attention of the media that in an effort to “get the cast into the proper survival mindset” director Joe Carnahan (@carnojoe on twitter) procured a wolf carcass ( which he had his cast consume in preparation for the film – an apparent attempt at method acting. Many organizations have expressed their outrage at the movie itself and the actions of its cast and crew and I join them in denouncing this grotesque distortion of one of natures most intelligent and important apex predators, as well as for their decision to consume such an inappropriate meal for no legitimate reason. PETA has already written about this issue, so has Ecorazzi.com and numerous other sites that are universally appalled by this film and the actions of its director and cast. I hope you’ll help spread the word and support me and others like me in an effort to show Hollywood that they have a greater responsibility to the people, our planet and all living things. I hope that everyone that reads this will help me and others like me to promote a boycott of this movie. Already over 5500 concerned citizens have expressed their opinion on this issue by signing the petition I helped start at Care2.com. Please express your distaste for this movie and the actions of its cast and crew and encourage anyone that cares about animals, truth and the environment to vote with their dollars and spend them on other less damaging forms of entertainment. Thanks for reading this and taking action to help preserve and protect the wolf. 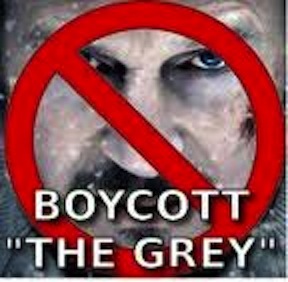 Boycott “The Grey” For Its Harmful Depictions of Wolves! This entry was posted in Blog Power, Personal, Political and tagged @carnojoe, @thegreymovie, Activism, boycott, defamation, Films, joe carnahan, killer, mischaracterization, protest, The Grey Movie, TheGrey, wolf, Wolves. Bookmark the permalink. i agree with admin and kylie. Wolves should not be used for props in movies- even if they are roadkill. RESPECT THEIR BODIES! would you like it if some person was knawing on your dead body for a MOVIE?! Man, I didn’t have a clue, until after doing some research tonight, about how many Americans hate wolves and predators in general. Shocking stuff. Anyways, I agree with you, but I think you may have wasted a bit too much energy on this one. People on the internet can easily choose what they want to hear. Proven by the fact that you usually don’t hear back from people after replying to to them with facts that counter their opinions, as seen here. Also, name calling doesn’t help. Yes, some of them may be ignorant, may be acting like assholes, etc…But you have to see it from their prospective and be understanding to get them to hear you out. And always show that you consider that you could be wrong (or be overreacting) too! Makes a HUGE difference. I disagree with all of you completely. Movies are fictional and star wars wasn’t boycotted because it was far from the truth. I think it was a great movie and it didn’t make me feel like I should exterminate all wolves. Should we also boycott all movies that show humans as blood thirsty serial killers? That’s soooo far from the truth right? There is always exceptions. Also the wolves in this movie are like mutant monsters on steroids, anyone can see it’s not based on reality. I think it’s not fair to the average person to post something like this and to assume that people don’t know fact from fiction. What the author has basically said is that people will just mindlessly kill wolves because Liam Neeson did it in a movie. Even then, he did it because the situation warranted it (despite the fact that wolves attacking humans are rare). It’s like saying that if people watch The Punisher, they will dress up in skull t-shirts and buy guns to kill criminals. Give people credit. We’re smarter than you think and I’m the one that believes humanity is a race of psychotic apes. It was a good movie I agree with you but at the same time I would hope that people would understand its fake. Its not like its a documentary and if people don’t understand that then maybe people should not be watching films. If you don’t like this movie then I don’t recommend you watch THE 2010 Frozen it also makes wolves look savage. Rather than boycotting a perfectly decent movie, try educating people about its science-fiction. this was an excellent movie that i enjoyed, and yes, it did portray wolves as being aggressive. it is however, foolish to think that humans are so stupid that we will all set out on expeditions to hunt wolves because we saw someone doing it in a movie. this makes even less sense than banning violent video games. if you DO feel an urge to go out and start killing random people because you saw someone do it in a movie, then please, seek mental help immediately. otherwise, im pretty sure that this is no worse than a movie portraying clowns as evil. I’ve read countless reviews of people criticizing the film’s harsh depiction of wolves and how the behavior of wolves is portrayed unrealistically, but if that’s what they think the film is about, then sadly they only see the surface; and thus missed the whole point of the film. I dunno if this 2019 comment will be shown, but you are stupid. As stupid as the average US citizen who does not understand fiction/reality differences. I’m happy to post comments that showcase the stupidity of the person making the comment. Congrats. Enjoy. PS: Did you even read the post?